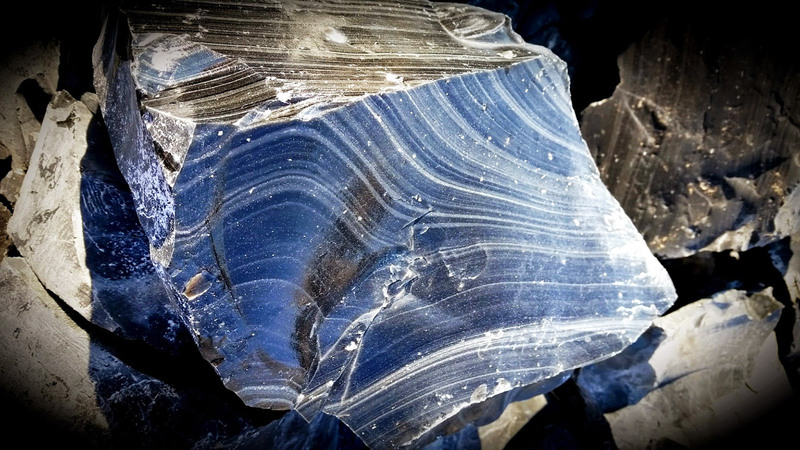 We just had to take a moment to share a photo our friends Patrick + Amy took of this blue obsidian, which I didn’t even know was a thing. Some of you who know me well may be saying to yourselves, “Wait, didn’t you get your bachelor’s in geology?” And, yes, that is true, oddly enough, but that was also roughly one hundred million years ago—so, yes, the Mesozoic—and I don’t remember ever coming across obsidian that was anything other than the blackest of blacks. I always loved it though, firstly because it was a cinch to identify—nothing else breaks in those conchoidal fractures quite like this volcanic glass—second because it’s just beautiful stuff. It’s produced when high silica lava cools rapidly, so theres little time for air bubbles to form in it or crystallization to occur, resulting in the dense, glassiness and super-sharp edges, used by various civilizations throughout time to create tools + weapons. Right, and members of the Night’s Watch in their battle against the White Walkers. Thus, this awesome image our friends captured on their drive down the west coast. Thanks trace elements or inclusions!